Every corner I turned yesterday, I saw durians. Less than a minute away is Taman Mesra, and the new mom-and-pop grocery store called Mun Cheong (next to LuMen Bookstore--I refuse to spell that 'lumen') sells durians (RM6/kg). The coffee shop next to it and the one behind too. A friend had just given us 3 durians on Sunday ("From my sister's fruit orchard in Kota Belud") and 2 are still sitting on my patio (durians are not fruits you keep inside the house) but I had to get the durians from the small coffee shop behind Mun Cheong, because last year they had some excellent durians. So I went there, thinking of a story to tell my Hub so he wouldn't know I've bought durians again (Eat them before he comes home! Tell him I found them outside our house! Tell him we have a durian tree we didn't discover until now! 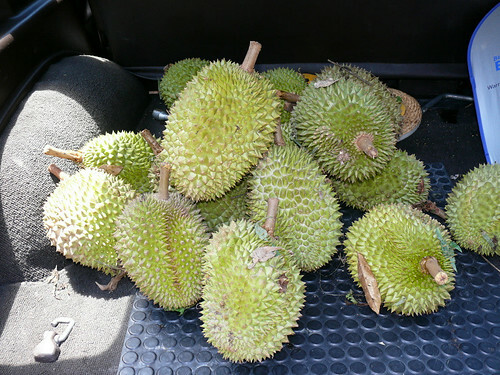 ), when a car stopped and out jumped J, who also loves the durians from that shop (The durians are from the shop keeper's durian farm in Papar. ). I felt assured that I wasn't splurging; buying durians is a necessity. I bought a large 2 kg fruit for RM16/US$4.30 (his durians are RM8/US$2.10/kg for large fruits and RM7/US$1.90/kg for smaller fruits) and am surprised because for the same size, a Thai hybrid durian is about 3 kg. It confirms my belief that even though Thai hybrid durians are fleshy, most of the weight is in the thick shells. I got home just as Hub was pulling into the garage and guess what? He was holding two durians, given by another friend whose friend has a durian farm too. Everyone has a durian farm except us, but we are lucky that we have generous friends. We opened my durian. It was gorgeous. It was the thin-shelled, spiky-thorned, white-fleshed original Malaysian durian that hadn't been modified by Thai botanists. The flesh was not too thick or thin (but can be thicker) but the flavor was intense. The flesh wasn't wet and there was no hard layer next to the skin. But wait. I tasted bitterness behind the sweetness. I stopped. I turned to the durians from Sunday and the ones Hub had brought home and devoured those. I don't like bitter durians, unlike most durian lovers. If I want bitter, I can eat bittergourd. The wondrous thing about durians is that each fruit, even if it's from the same tree, can taste slightly different, each with a different blend of flavors and intensity. It is truly an amazing fruit, did I tell you that already? But if you've tried durians and hate them, chances are you ate Thai durians, which Malaysians, Indonesians and Singaporeans (united about one thing for a change) dislike. Thai durians are bred for export and grown to reduce their flavor and increase the thickness of their flesh (making Thai durians taste like sweet potatoes) and these two characteristics of Thai durians are worsened by the picking of the unripe fruit (genetically modified to have shorter, blunt thorns and short trees) unlike Malaysia durians which are allowed to ripen and drop. 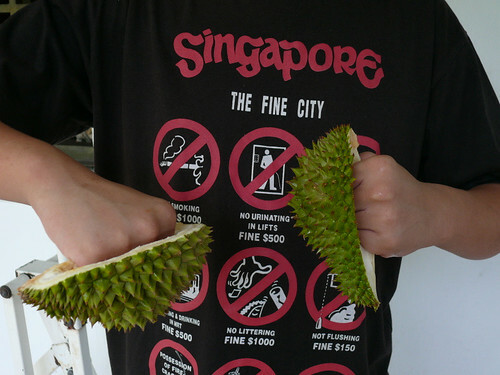 Malaysian durians, however, are genetically improved to have thick flesh without loosing their flavor, so that's something we've done right. 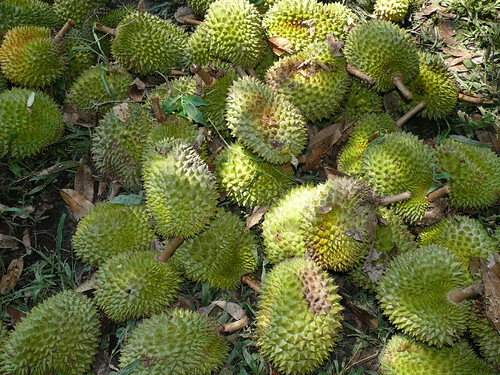 Read one of my impassioned posts on durians here. Now that I've made my preference clear, let's move on. So I have these durians and not enough stomach capacity. I have already made durian fresh cream cakes last weekend. A West Malaysian told me once that he eats his durian with plain white rice. In the Indochinese peninsula, durian is eaten with sticky rice, coconut cream and gula melaka. Since durians, gula melaka and coconut cream are my top favorite food, I spent an hour searching for the right recipe . Most of the recipes tell you to soak the rice for hours, steam it without coconut milk, and make a sauce with the gula melaka, blended durian flesh (ruining the durian) and coconut milk . I am not one to wait 3 hours for my rice to soak, and I prefer to have my rice with coconut flavor (but not too oily, so I used the second squeeze of the coconut) and taste the texture of my durian, so I didn't blend the flesh or cook them into a sauce. As for the salt, the Thais have a habit of salting their desserts very heavily and I think that's a strange and harmful habit. First of all, the sweetness is confused with the saltiness (if you've been to Thailand, you'll know that they don't add salt like we do, in a trace, they add enough to make their desserts salty. Yes, today I'm not bashing Singapore.). Second, the heavy addition of salt means you need more sugar to taste any sweetness. There's this disease called dia-be-tes. Just as I was about to publish post, Hub walked in, holding two big plastic bags of wild durians, called dalit. He was in Papar this morning, and he reported that the town if filled with durians. I made a quick switch of the dessert, chucked out most of my white durian and replaced them with the colorful wild durians. 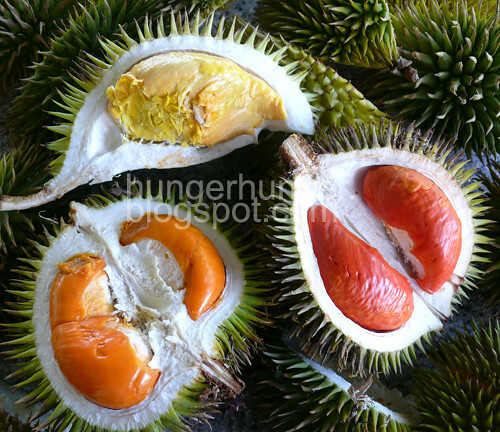 Here are the 3 types of wild durians from Papar: yellow, orange and reddish-orange. The yellow was great, thick-fleshed, creamy and flavorful, the orange was too wet, thin-fleshed and had a strong alcoholic flavor (which many durians have) but the orangy-red ones were my favorite: full, intense wild durian flavor (which puts the regular durians to shame) and so creamy that it was waxy. But it's not just the intense flavor or creaminess that makes wild durians so heavenly.If you sniff the shell of an unopened wild durian, it smells like regular durians. But when you taste it, the wild durian is infinitely better, with blended layers of different flavors that can taste like a combination of roasted peanut butter, vanilla, candy floss and many other flavors that I am at a loss to describe. I read a comment somewhere that durians do not look like fruits because because they look 'organic'. These wild durians sure look like kidneys. Take a look at the most exotic durian I've ever tasted, the red durian. So what do I think of sticky rice with durian? It was delicious, heavenly, unbelievable. Maybe because the wild durian flavor was so strong, the gula melaka and the coconut cream didn't mask the flavor of the durians but instead the cream blended with the rice and the durians while the gula melaka gave extra sweetness to the dessert. 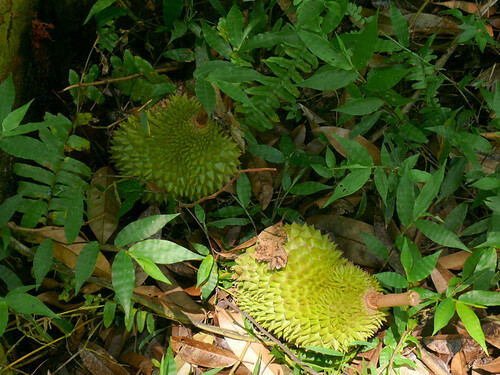 Each of the wild durians had its own special flavor. I felt so privileged eating them. Heaven. But the dessert also made me feel heady, hot, like I've been drugged or intoxicated, and very full. I think I can omit the rice next time and just add the coconut milk and sugar syrup. And I think it's time to cool off durians. Until this weekend that is. * Add 1 cup room temp water to 400 g (from 1 coconut) shaved coconut. Massage the coconut and squeeze the milk out, with a sieve over the container. You will get more than 1 cup. Chill this in the fridge. Add 1 1/2 cups water to the squeezed coconut, massage again to release the milk, squeeze over a sieve into a container. 1. Wash the rice, place into a steaming plate and sprinkle a pinch of salt over. Add 1 1/4 cups (or 1 cup if you like your rice with a bite) of the second squeeze of coconut milk to the rice and steam at high heat for about 8 minutes. Remove, fluff and let cool. 2. To serve, scoop 2-3 spoonsful of the rice into a small bowl. 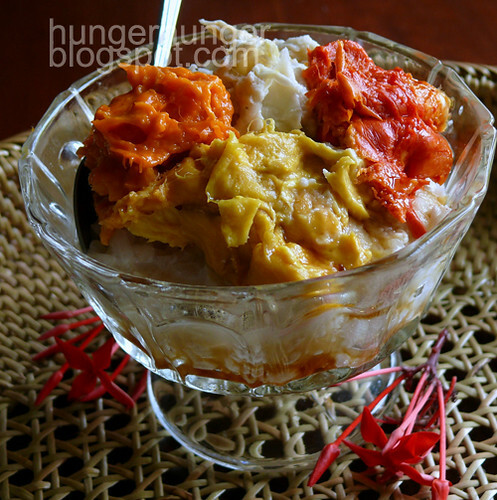 top with lots of durian flesh, pour some sugar syrup over and finally a generous amount of the thick coconut milk over. Oh. My. Goodness. Labels: CakesNDesserts (Asian), What's That? Wild jungle durians that taste a thousand times better than regular durians, so creamy that the texture is nearly waxy. Proudly found only in Borneo. 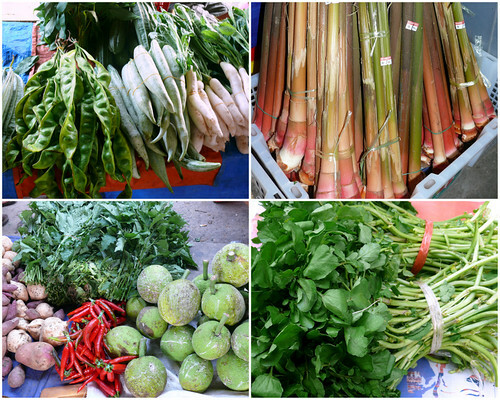 Fresh veg, most of them from the jungle (ferns and native veg) or home-grown, all freshly picked. 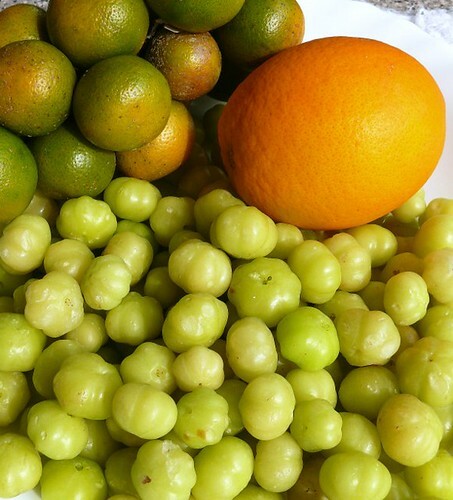 Nearly extinct fruits called yew gum jai, very sour and eaten with salt or pickled in sugar-vinegar-chili solution. Common ginger and its flowers. 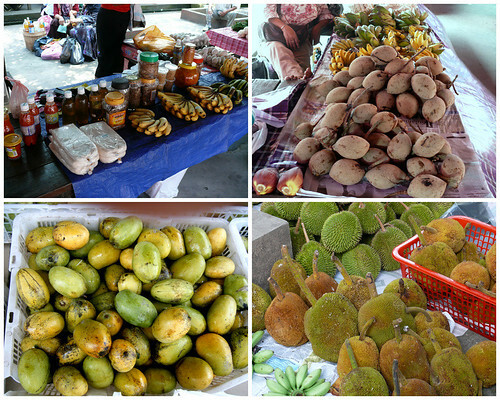 Native pickles; bambangan; mangoes and the fruits of the season--tarap (proudly only found in Borneo!) 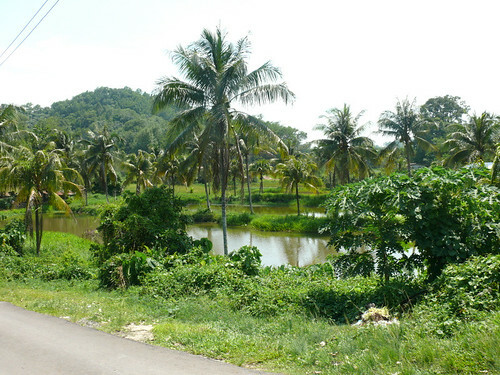 and kampung durians. 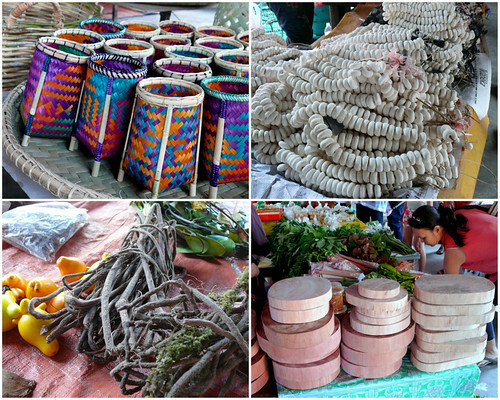 Handicraft; yeast for making rice wine; pepper roots (I was talked into buying--by a Singaporean-- a bundle to make soup) and chopping boards. Singaporean tourists buying unpolished multi-colored hill rice (and ginger, mustard green sprouts, dried shrimps, fried tofu--I was like, "What, no fried tofu in Singapore??" Answer "They don't make them so authentic anymore! 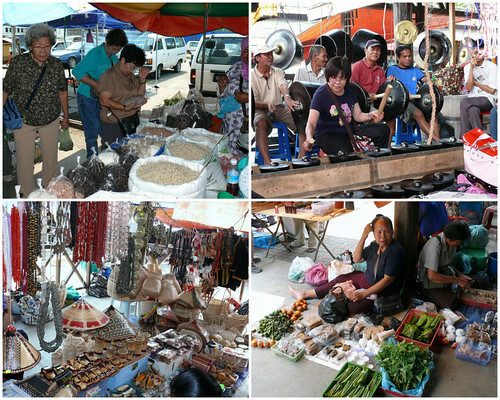 "); another Singaporean trying out the gongs; native handicraft and lady selling areca nut paraphernalia. 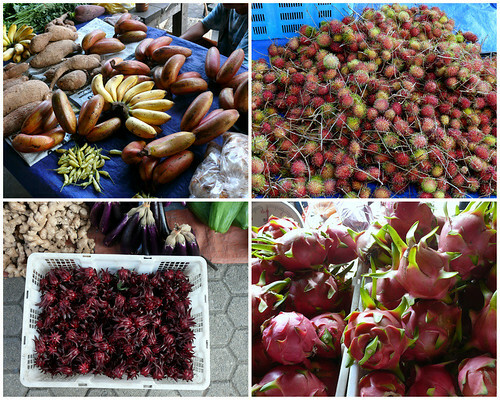 Bananas & tapioca (cassava); rambutans (hairy fruit); rosella flowers and dragonfruits. 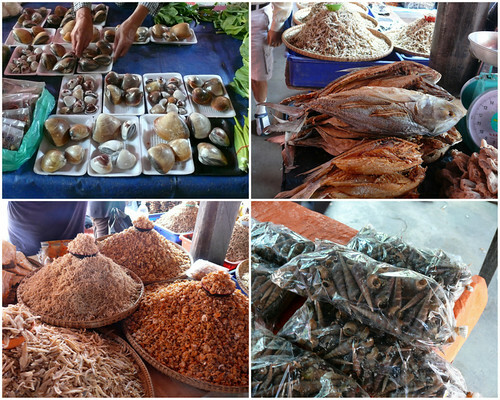 Clams; dried fish; dried shrimps & anchovies and whelks. 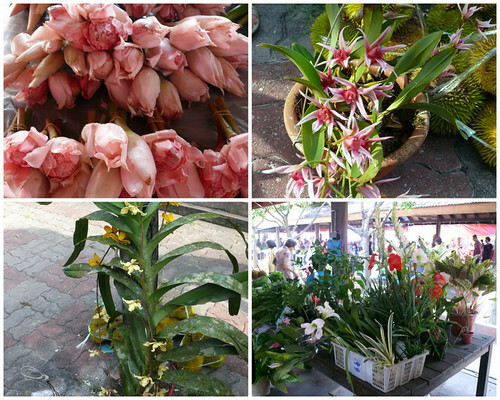 Bunga kantan; wild jungle orchids (going for RM10-15 only! But should we buy them and speed up their extinction?) and an assortment of houseplants. Petai (giant stinky beans); tuhau (a variety of ginger); chilies, breadfruit and the freshest and strongly scented (not the wimpyly-flavored variety in western salads) watercress found growing in running streams. Frogs; tortoise (or maybe turtle); terrapins and eels,. 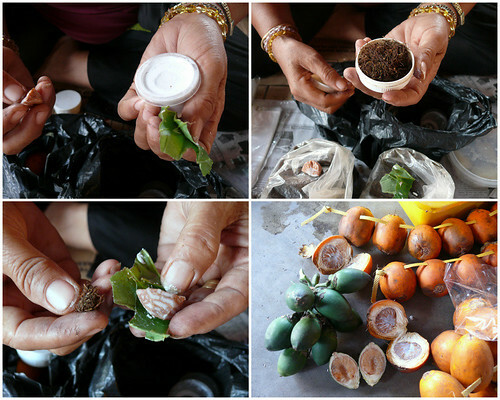 How to make a betal nut snack with tobacco, slaked lime (I think), areca nut and betel leaf. ...sago worms? I hear they are delicious. p.s. This is Sabah, Borneo, Land Below The Wind, the sandstorms, wildfires, typhoons, hurricanes, tornadoes, earthquakes, droughts and volcanic eruptions. Sadly, we are not exempted from politicians. Labels: Misc, Proudly Malaysian, What's That? This has been such a looong holiday! And that's one nice thing about Malaysia--we get so many public holidays. We were home playing Scrabble for the first time in don't-know-how-many years (tricked Hub and Wey to play with me, citing pre-dementia and the need for brain exercise), when Y called and said we better rush to her friend's durian farm if we want some King Of Fruits. The direction was to go up the hill in Bukit Padang, then down and turn right at the junction, then go on the road for about 5 minutes until a small road on the left with a sign that says Jalan Lomudu, I think, and Dog Training Kennel. Just opposite to Country Shangri-la (I think), a new housing. Go on the small sealed road, past the dog training center on the left, and after less than 2 minutes the road will fork left and right. Take the left road that goes downhill and you will soon see a sign that says "Private Property" on the barbed gate. That's where Josie, the owner, will meet you if she's there. Her mobile no is 019 820 7941. On week days she's a busy lawyer so call her on weekends. Her durians are expected to last until end of Oct but don't count on my estimation. Hurry there before the fruits are gone. It's crazy that we have a durian farm nearly at our doorstep--the drive to Bukit Padang is 10-15 minutes, from there to the farm is 5-7 minutes. Thank you Josie, for fulfilling our dreams. As lovers of durians, it was exciting to be in a durian farm. It's like Japanese ladies in LV stores, I guess. Josie had some problem getting workers to pick up the fruits from the jungle floor so she roped in a couple of her nephews. We were given two durians to sample. The first was wet and bland but the second was very good, with medium-thick pulpy flesh and good fragrance. Wheelbarrows of durians kept arriving from the jungle and we were free to pick. 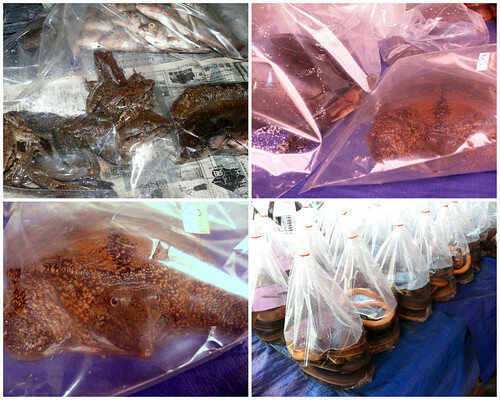 The big ones, nearly 3 kgs, cost RM8/US$2 while the smaller ones are RM20/US$5.40 for 3. I'd say the big ones are a better deal. In KK, we pay about RM10/US$2.70 to RM18/US$4.90 per kg and a medium-sized durian is about 1.5 kg. 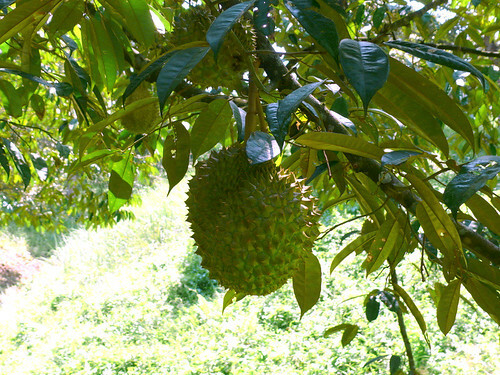 However, different types of durian trees are grown in the orchard and they have no idea which tree is D24 or tembaga susu (milk durian), so you may not get what you like. Also, the trees were planted in the 80s, before the new species of grafted trees were available. We walked a short distance into the orchard, which was hilly (durian trees thrive on hilly terrain), and came out fully appreciative of the work behind growing and harvesting these heavenly fruits. The durian is truly not an easy, ordinary fruit to grow and harvest. It's so grand and wild, it can't be farmed and has to be grown in its natural habitat, the jungle.The trees grow very tall (over 10 metres) by the time they fruit so it's not feasible to pick the fruits, leaving no option but to wait for them to drop. This means the fruits will roll into ravines and thick undergrowth (snakes!) from where workers will have to search and bring to a collecting area. This also means that at any time you may get killed or at least get your head busted by a falling durian. We heard a few fruits fall around us while we were there. We decided that we will not 1) haggle with durian sellers now that we know how hard it is to harvest these fruits 2) start that dream durian orchard; just too much work. 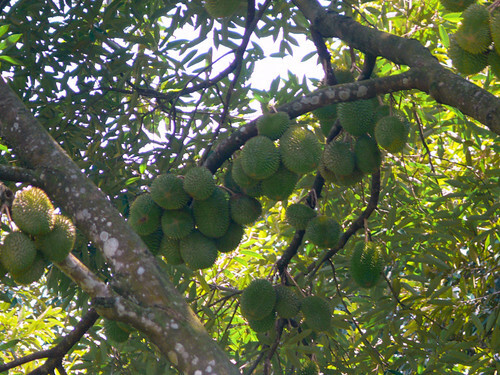 On top of all that hard work, durians are bitten by bugs, eaten by squirrels, susceptible to jungle fires, thieves and diseases. And some trees can fruit twice a year, but most only once a year. When you think of it, this fruit truly deserves to be the King of Fruits. 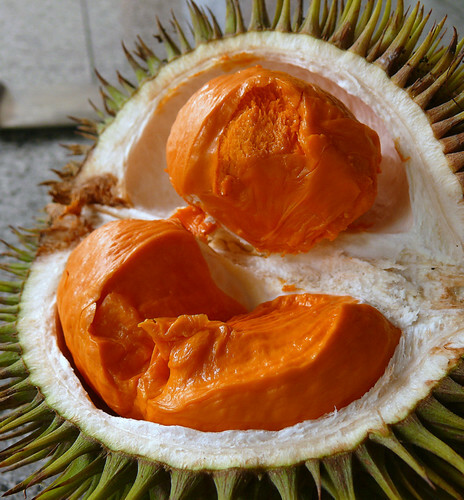 It is a fruit like no other in looks and taste and to those who describe it as eating ice-cream in a filthy toilet, I hope they continue thinking that and leave durians to people like me. Just last week, Lily, who's from China, was initiated by us into eating the sukong jungle durian. She hesitatingly bit off the pulpy orange flesh, widened her eyes at the taste and flavor, then closed her eyes and went "Mmmmm...so good....soooo gooddd..this is too goooddd." Prior to this, her favorite fruit was China peaches, a subtly-flavored fruit compared to the intensely perfumed durian. Btw, somebody please tell Anthony Bourdain (who also went, "Mmm..amazing.." when he ate durians on one of his recent shows. He seemed genuine about it) that durians are opened by splicing the cavity lines apart with a small knife and not chopped by a parang into two crosswise like a watermelon. Yes, the new grafted durians are harder to open as the join lines between each cavity section are not as pronounced as in old-fashioned durians. I have been tempted to chop my durians too. And please, Anthony, eat durians with your hands, don't use a spoon. That's like eating an apple with a fork. Have you noticed that tropical fruits are usually big, multiple fruits while temperate fruits are usually small individual fruits? I think God made them according to the cultures of the people living in each place. In Asia, eating is very communal and large fruits like the nangka, tarap, durian, pineapple, cempedak, papaya are shared unlike an apple or a strawberry which can only feed one each. Wait. In Asia, fruits like apples, oranges, pears etc are sliced and shared too. Fruit for thought. If you get your durians from Josie, remember that you need to keep them for a day or two because they are fresh off the tree. That's the hard part. I have to wait a couple of days to eat those 18 durians. Fruits like berries have to look pretty and colorful to attract consumers but the durian is made to look menacing and smell 'odd' (although if you are a durian lover, it is heavenly) for a reason. Duri means thorns and all those thorns are needed to ward off jungle animals (and humans) who know what lies within that shell. So for those who have never eaten durians, just imagine how much better durians taste compared to berries! 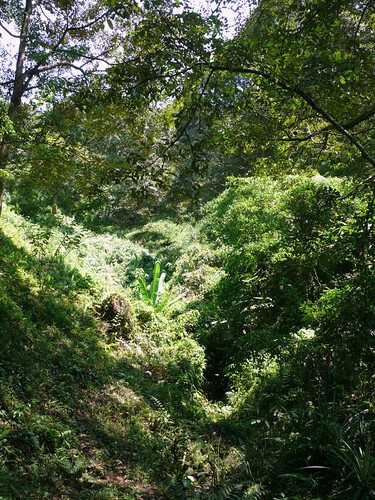 Workers search for durians in ravines such as this. The scenery is great too. Labels: Family Fun, What's That? So I came home late after painting the town red and there was nothing prepared for dinner because my mobile phone was dead and I couldn't call my helper. Plan B was out because Wey didn't want bak kut teh and hubby as usual didn't want 'outside food'. Short of cooking instant noodles for dinner (haven't done that yet; Plan C), the fastest meal was western, or pseudo-western. So I rushed to the best roasted pork stall in town (Merdeka Supermarket) and grabbed some slices of roasted pork and some salad greens (very limited choices here). Potatoes looked like a good change from rice and bread but I just did crashed hot potatoes 2 weeks ago so I sliced the spuds (and my thumb) and made these potato galettes which my son said were better than the pork. I rest my case. 1. Oven at 220 C.
2. 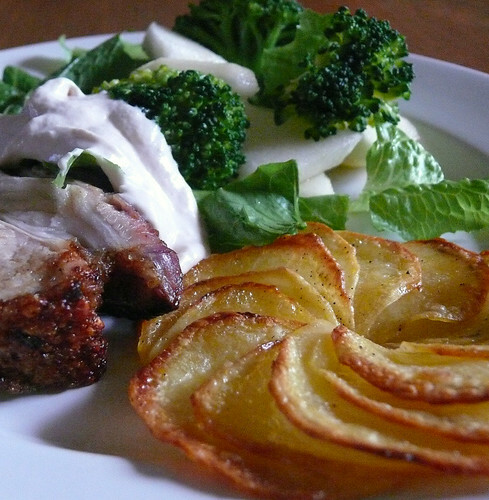 Peel the potatoes and use a mandoline to cut them into thin slices. Grab 4 to 5 slices and swosh them through the melted butter to coat. Shake off access butter and arrange the potato slices, overlapping in a tight circle, on a baking tray covered with aluminium foil. You'll need two trays. 3. Sprinkle some salt over and grind some pepper too, pop the trays into the oven and let the taters cook 20 minutes. 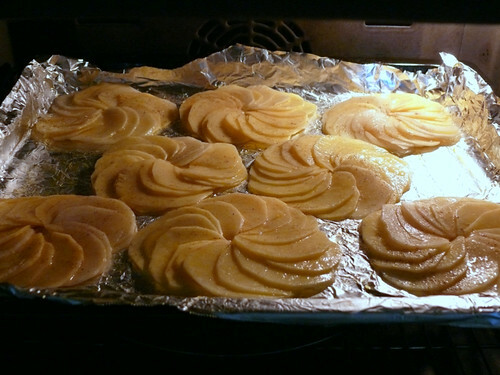 Turn on the turbo fan and let cook another 5 minutes or more until the edges of the taters crisp and brown. Serve hot. Frankly I like my saba mackeral (horse mackerel) grilled with some oil and coarse unrefined salt, dripped with freshly squeezed lime and eaten with a hot bowl of rice. 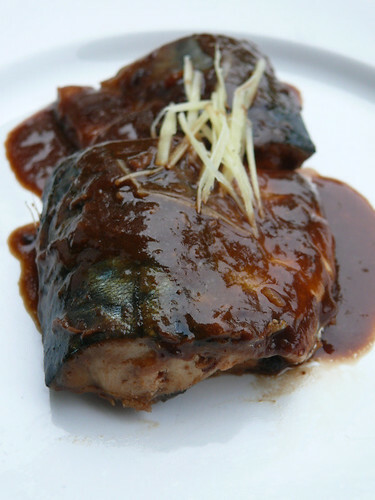 But since that's too common, here's saba mackeral cooked with miso. 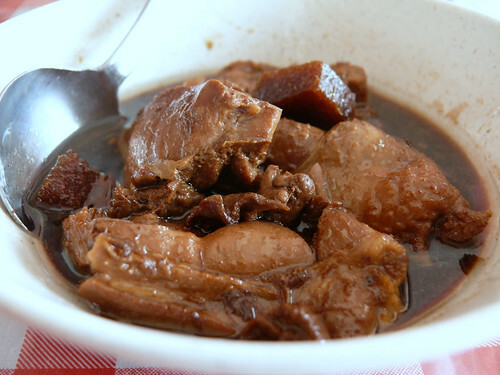 The Chinese version uses fish slices and daojang (Chinese bean paste) and tastes better, IMHO. Saba mackeral has tripled in price in the last 8 years. Recipes House was the only place selling it then, about RM10 per kg for the frozen fish, and a friend found that the fish were being sold at about RM6 in Miri so I told the good people at Hong Seng, and they brought the fish in and sold them at RM8 per kg. Now, the fish is sold at RM29 per kg, a jump of RM21 in 8 years. That works out to nearly RM3 increase every year. Btw, our local mackerel and saba mac are very different. Our local mackerels, the ikan kayu, tastes just like its name, 'wood fish', because there isn't much oil in it unlike saba mackerel, which is from cold waters, usually Canadian waters. 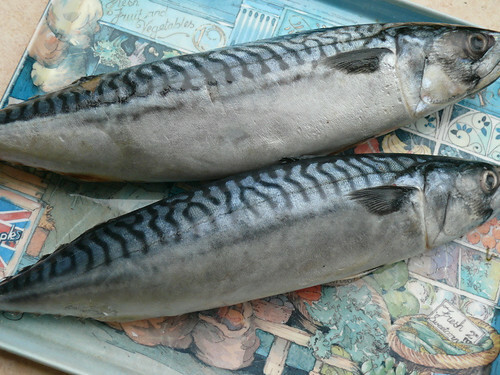 Many people dislike saba mackeral because of the fishy smell. It is rather fishy, but it's also tasty and easy to clean--no scales or hard bones to cut. The fish thaws fast because it is so oily and you don't need to wait for it to fully thaw (we only get frozen saba mac here) or it gets mushy. Clean it when it's about half thawed. If you really hate the fishy smell, maybe sanma is a better fish for you. I love sanma fish. It is more delicate than saba mac, and is slightly cheaper at RM27 per kg. Sanma, like saba, is best grilled with oil and salt. Oh, yum. But back to saba in miso paste. You can use any miso but since I have white (which actually is creamy color), brown (the regular miso for soups) and red miso (dark brown), I used a bit of all but more of the dark. I'm so thankful to Tina for telling me to store my miso in glass jars in the freezer compartment where they can keep longer plus they don't freeze so I can use the pastes immediately. I've also found that belachan doesn't freeze in the freezer too so I toast and mix the belachan with some lime juice and keep it in the freezer for use anytime. Btw, my friend R sent me a mail on home tips and the one I love most is the one that teaches you to keep your clean sheets folded in its pillowcase. No more looking for the matching pillows! Am I the only one who never thought of that?? Prep: Fillet the fish. You can leave one side with bones on. Cut each fillet into 8 cm chunks. Cut two thick slices of ginger, then cut the remaining ginger into very thin strips for garnishing. 1. Put the ginger slices, sake, mirin, soy sauce, sugar and water into a pot or frying pan big enough to hold the fish slices in one layer. When the sauce boils, let it boil 2 minutes, then add the fish, skin-side up in one layer. 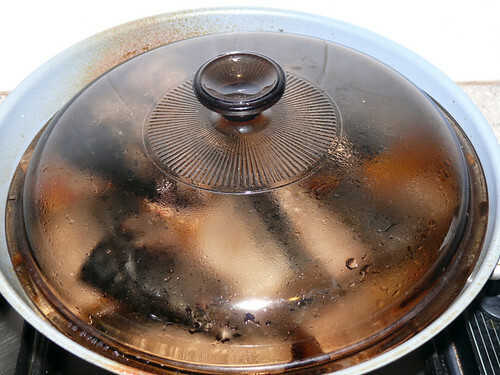 When sauce boils again, reduce fire to medium low, put the lid on. I used a frying pan and a lid from another pot to give a tight fit. 2. Once in a while, baste the fish with the sauce and shake the pan or move the fish gently to prevent them from sticking to the pan. Cook for 10 minutes. 3. Carefully pour out some of the liquid into a bowl, add the miso to the liquid and whisk until the miso is well-blended. Add the miso liquid back into the pan and continue to baste the fish with it. 4. After another 5 minutes, the liquid should be thick. If it isn't, lift out the fish onto a serving plate and increase the heat so that the sauce thickens. 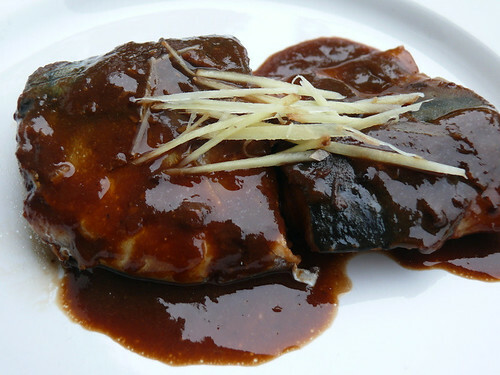 Pour the sauce over the fish, top it with the ginger strips and serve with hot plain rice. There are western chives, which look like spring onions but are more delicate with a hollow center and there are Chinese chives, which are flat. Chinese chives are more pungent in flavor than western chives, especially the flat Chinese chives while the bud chives are less so. The flat chives flourish in our weather, and my patch of flat chives has been with me for about 10 years. 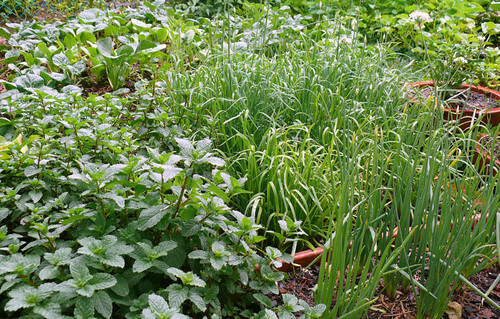 These perennials can be cut down to the soil level and within 3 days they will put up an inch of new shoots. 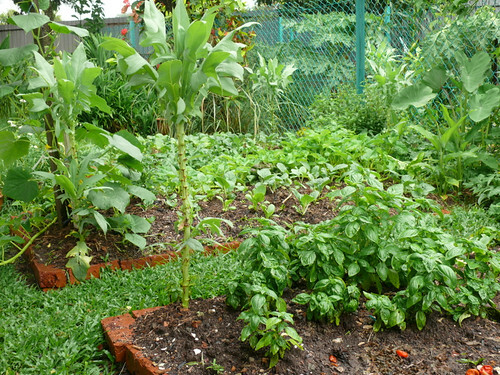 They never get eaten by snails or any insects and I suspect that they keep my veg plot free from pests. They do need a lot of fertilizers or they begin to look like weeds. Flat Chinese chives in the middle. 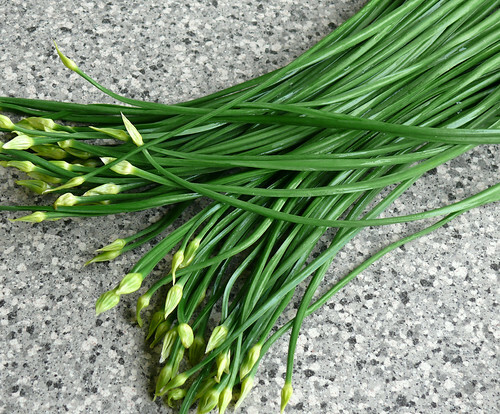 Flat chives are usually cut finely for making omelettes. A special version of flat chives is the jiu hwang, light yellow chives, which are grown like white asparagus--under cover and deprived of sunlight so there is no color pigment in them. These are more delicate and sweet but not easily available because they deteriorate within hours of cutting. Bud chives are from China and are sweet with a nice bite. I suspect that bud chives are just the budding stems from the ordinary flat chives but Chinese farmers have a way of growing only stems with buds. My flat chives grow stems with buds too if I don't harvest them but those stems are too hard to eat. 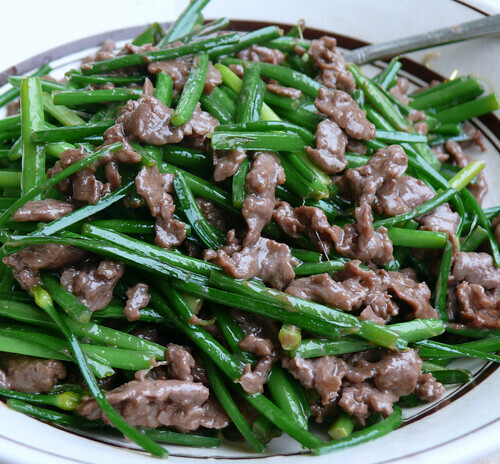 As a simple veg dish, you can fry up a plate of plain bud chives or better still, add some meat such as prawns, chicken or pork but they go best with beef. Like we all know, sometimes the simplest dishes are the most delicious, and this is one of them. Prep: Snap the chive from the bottom. It will break at the point where the stem is too hard for eating. 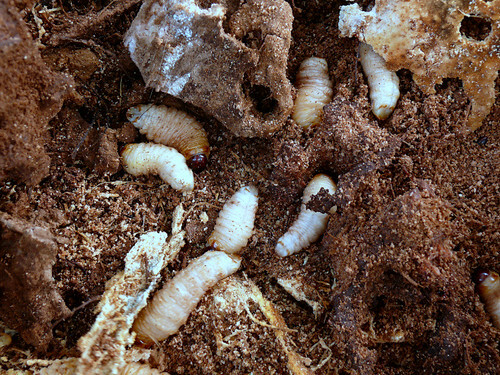 Throw that part away (into the compost!) and either cut or snap the younger stem into 4 cm ( 1 1/2 inches) lengths. Cut the beef into thin strips and marinade with: 2 t light soy sauce, 1 t oyster sauce, 2 heaped t corn flour, 2 T water, 1 T rice wine, 1/2 t fine sugar, some freshly ground pepper, 1/8 t salt and a splash of good (Korean is best) sesame oil. Leave for 5 minutes. 1. Heat 1 T veg oil into a wok, add the chives and a pinch of salt and stir-fry until chives are bright green or half-cooked, or fully cooked as preferred. Splash 1 T shao xin wine or rice wine over the chives, stir and remove onto a plate. All at medium high heat. 2. In the same wok, add 2 T veg oil, coat the surface of the wok up to halfway. 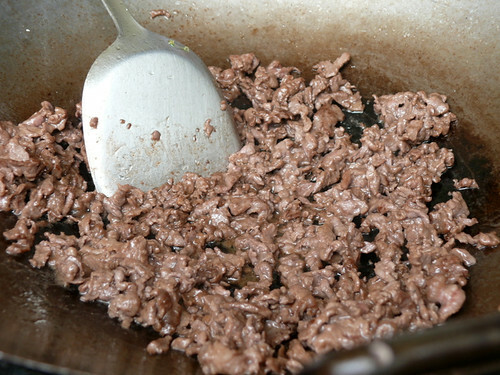 Add the beef and use your frying ladle to spread the beef into a single layer. Let it fry at high heat without stirring for about 1/2 minute. Now use your ladle to turn the beef over and let it cook another 30-40 seconds without stirring. Too much stirring toughens the beef. Now the beef should have turned mostly pale instead of red. 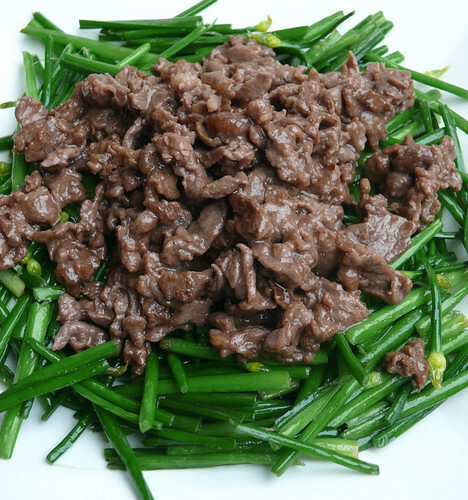 Use your ladle and stir the beef to mix well and add about 2 T water or stock, then either a) add the fried chives to mix & fry a couple more seconds (high heat) and remove onto a plate or b) arrange the beef on top of the fried chives. I almost never have an egg in my instant noodles unlike most people. I love my instant noodles with lots of veg, and if in Australia, I make it luxurious with lots of beef strips and button mushrooms. I always tell my kids that I think God's best food creation was the egg while men's greatest food invention is...instant noodles. You are starving, climbing the mountain, in a camp, have the runs, lost your appetite, haven't got your pay check yet, your MIL bullied you, what do you eat? Instant noodles are light, compact, easy to bring along, cost less than a can of Coke, can be cooked in an instant (ya, duh), are cheap and are delicious. I think my middle child grew up on instant noodles, especially when he was in mid-teens and always hungry. I wonder if there's a height link--Ming eats a lot of instant noodles and is 6 feet (like everyone, he claims himself taller) tall. Yi doesn't eat instant noodles and has remained at her Grade 9 height, which is, ahem. I know that's rubbish. I'm just adding fuel to all the myths about instant noodles, the no. 1 myth (or truth?) being instant noodles cause alopecia (because of the msg, which is the main ingredient that makes the noodles delicious) and cancer, because it has all those additives, including wax, which is supposedly used to coat the noodles. But I'm not one of those mothers who avoid instant noodles. I have two dear friends who scorn at my appreciation of instant noodles. They think instant noodles are never to be given to kids but strange enough, these dear friends let their kids eat those highly processed, highly additives-spiked frozen sausages which I avoid as vehemently as they do instant noodles. We get a very limited choice of instant noodles here. I always check out the instant noodles aisle in supermarkets when I travel and I've been known to lug back a box of the stuff when my luggage limit is already busted. I've also been known to hide them from my boys. One of my fondest memory was what happened years ago when my MIL had her way ("Your kids should come first, travel can wait! "), I sulked in bed all day, genuinely feeling miserable, and little Ming brought me a bowl of instant noodles he had cooked. The next day I flew off to Hong Kong, with the blessings of my Hub much to MIL's indignation. 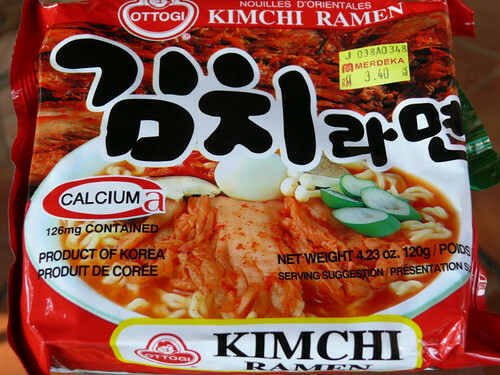 I have a list here of the instant noodles that I've eaten the last few weeks. I'll start with my least-liked ones. Why I bother to have them on my list is because there aren't that many brands of instant noodles to make a list of if I don't include them. 1. 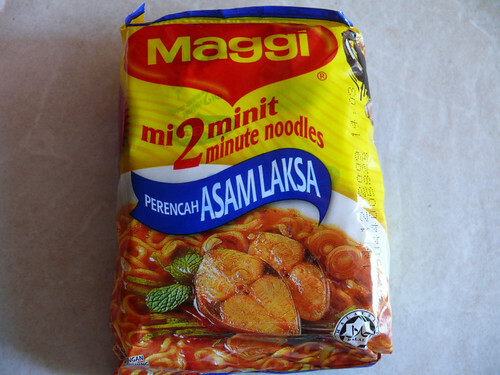 Maggi instant noodles, Malaysia's favorite. Surprise--I dislike Maggi instant noodles. The texture of the noodles is spongy instead of springy. Okay, if I under cook them, they give a slight springy bite, but that is only for a few seconds before the whole bowl of noodles becomes soft. Bleh. If anything, I do like Maggi's flavors. I wish they would get their noodles right. Along with Maggi are substandard noodles like Cintan (I liked their assam laksa once upon a time), Mamee and all those forgettable names. I know most students like Maggi, and in Australia, Indomie. But I did say students, didn't I. 3. Ah, Nissin's instant noodles. 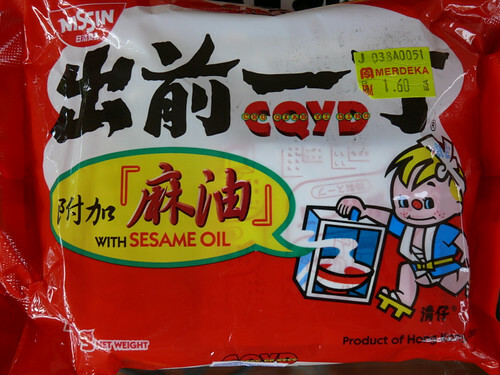 I like this, especially the sesame oil flavor but the noodles are not as springy as I would like. See that drawing of a little boy on the packet? Regardless of brands, instant noodles are called "goong jai meen" in Chinese and it means 'doll's noodles'. I think it is because the first brand of instant noodles is the Doll brand from Hong Kong and their logo was a doll in the shape of the Chinese word for 'ren' or people. 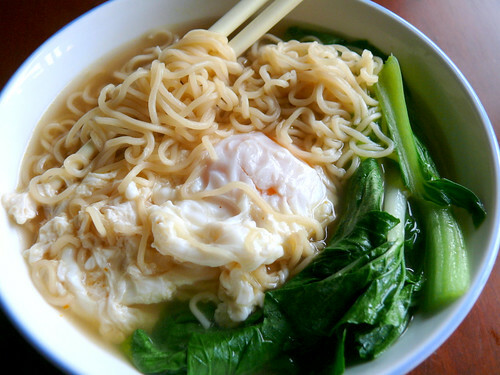 Read about instant noodles here. 4. 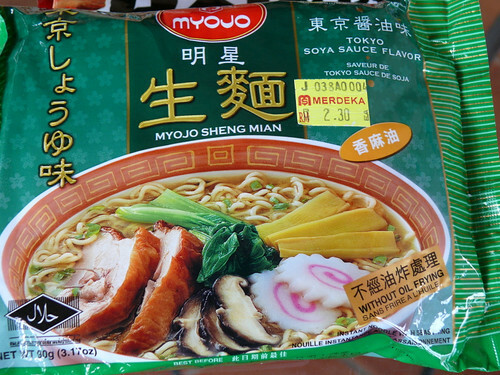 Myojo's instant noodles are good. I've shown two of their best here. The noodles are springy and the flavors are good. I like. 5. This I had to get my friend Y to bring back from Hong Kong because they don't sell them here anymore. Tell me if you see any in our stores. Strangely, they seem to have only Creamy Shrimp flavor Yum Yum in Hong Kong because that's what I found too when I was in Hong Kong last year. I ate some other fantastic flavors in New Zealand, of all places, a thousand years ago. I have to say Yum Yum is by far my favorite instant noodles. The noodles are flat and thin and super springy, and because the noodles are coated with msg and flavor too, they blend with the fakeness of the msg soup, unlike noodles without a seasoning coating which can taste very 'unconnected' because the soup can be highly flavored while the noodles are bland, and you taste both in one mouthful. Know what I mean? Yes, the mother of them all, for me, is Yum Yum! I do have a complain about Yum Yum. The taste is usually a bit on the sweet side. 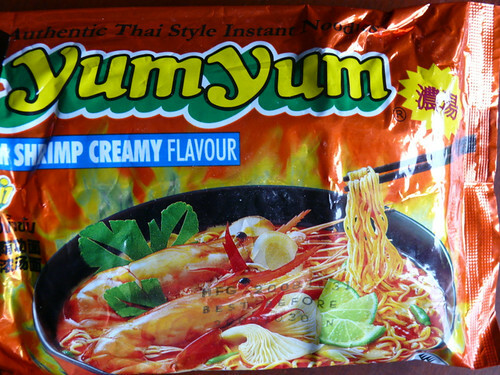 When Y flew back to Hong Kong last week, I told her I wanted Yum Yum which is from Thailand but she wasn't sure so she bought me MaMa too, which is Thailand's top instant noodles brand (thanks, Y!). I haven't tasted it yet but I have a feeling it'll be good. Btw, I think American/Canadian instant noodles taste the worst of them all. 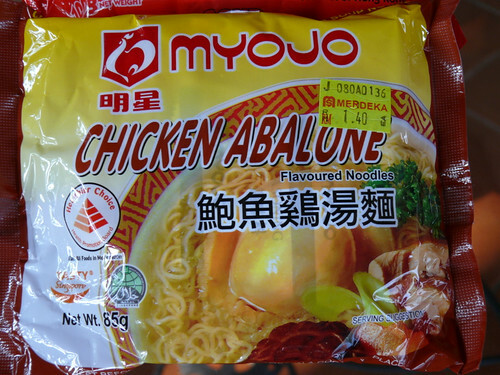 They taste like what they are: American/Canadian instant noodles with funny flavors and texture. A totally different thing. I also like Tung-I although now we only get its cousin Tung-e, I don't know why. So wonderfully full of onion oil and msg deliciousness. What brands of instant noodles do you like? Tell me, I'll look out for them. Last Friday, I ate an ordinary-looking extraordinary plate of fried mifun. The simple white mifun without soy sauce or much meat was of the perfect texture, not too soft or hard, and not too oily too, and it was very tasty and fragrant with an unexpected ingredient--bunga kantan, cut so finely that I couldn't see it. The next day, 12 hours after I ate the mifun, I was at Frankincense Cafe to eat the same thing again. There aren't that many items on the menu, which is not surprising since this is a mom and pop kind of restaurant, with only one helper. 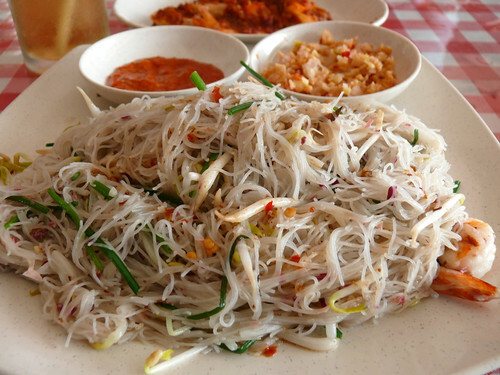 As Casey's wife Katherine is a Kadazan, the restaurant serves a mixture of Nyonya and Kadazan home dishes. One of the side dishes that goes well with the mifun was tuhau, which I've read about and seen in markets but never eaten before. I loved it immediately. 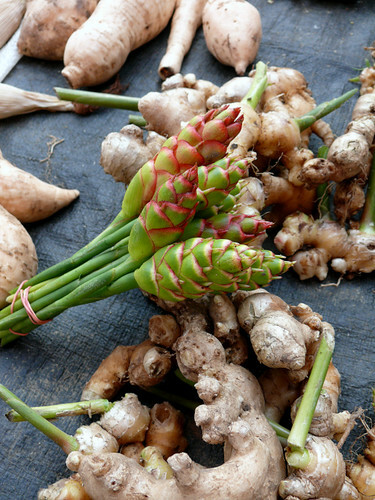 Tuhau is the stem of a ginger (not the bunga kantan) which the Kadazans love to serve as a pickle side dish to fried fish and rice. I am going to post the recipe as soon I get some tuhau but you can jump ahead and get it from here. Frankincense's fantastic bihun goreng special (special fried mifun) is simple but delicious and full of flavors, RM4.50. I was told later that it is best fried with dried shrimps. The tuhau is at the back along with a small dish of chili belacan. 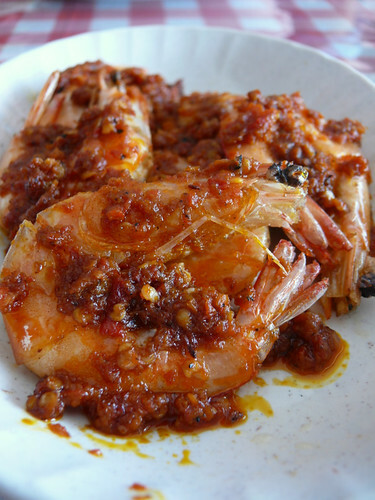 Udang chili garam, salt and chili prawns. It was not as flavorful as it looks though. 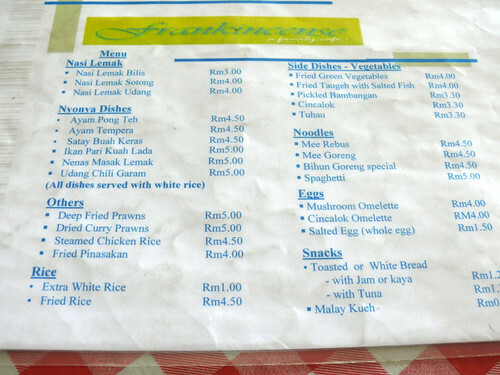 Only RM5 for 5 prawns! Ayam pong teh, stewed chicken in soy sauce I think, RM4.50. This simple stew would be good with plain rice. 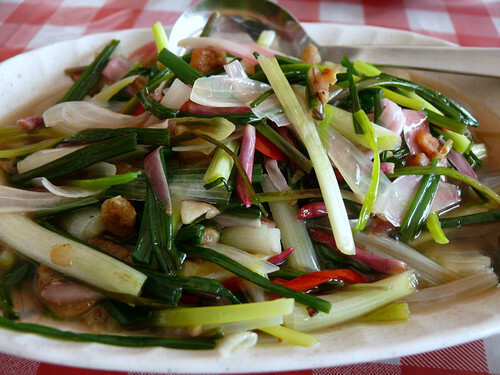 Fried Ranau veg is a mixed plate of native garlic chives, bunga kantan, chilies and dried prawns, RM4. I found this dish too oily but eating the garlic chives (lots of fibre) reminded me of my Dad who used to cook them with beef and dried radish. I want to go back to Frankincense for the cincalok omelette, the nasi lemak, the ikan pari kuah lada...but most of all, for the bihun goreng special. 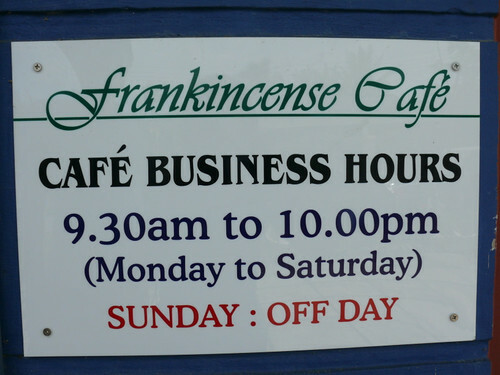 Frankincense Cafe is at the Kepayan Commercial Center. You can go there through Austral Park or by way of the Penampand By-Pass going to the Kepayan Commercial Center. The restaurant is opposite to Avena Cake Shop. I don't remember if I've told you before, but my helper has only three ways with fish--whole fish are either steamed Cantonese style or fried and doused with black soy sauce while fillets are breaded and deep-fried. She chooses the method of cooking based on the fish. Fine-textured fish are steamed and coarser ones are fried. Sometimes I cook Teochew-styled steamed fish and regret it later because the tangy sauce makes me eat tons of rice with it. It can be a simple complete meal too because if you add enough 'toppings' you'll get the fibre and vitamins from them. You can see from the photo that I've overloaded the fish with a blanket of toppings. Under the fish is another layer of tomatoes, lily buds and so on. The cherry tomatoes are from Y's garden, and I always have spring onions and parsley in my garden. I think we are quite self-sufficient when it comes to greens. Take a look at what's growing in my back yard. If you've ever been to my house, you'd have heard me gush about how fresh my veg are--sometimes I think they are still alive when I cook them. Some people ask why I bother to grow my own veg and I realise that no matter what I tell them, these people will never know the thrill and joy of gardening. I just give easy answers like I don't need to wake up early to jostle in Lido market for organic veg. We compost everything that's biodegradable so there's no shortage of good soil. 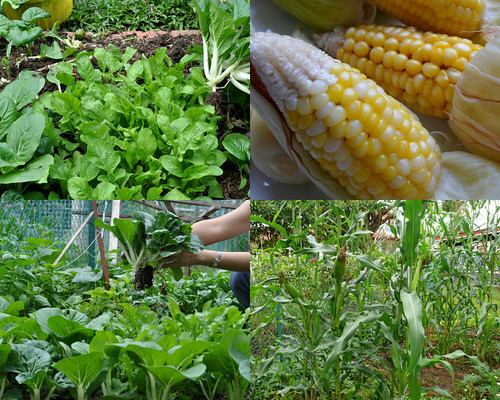 If you have a bit of yard, you must grow your own veg and reduce dependency on tasteless, stale supermarket produce. 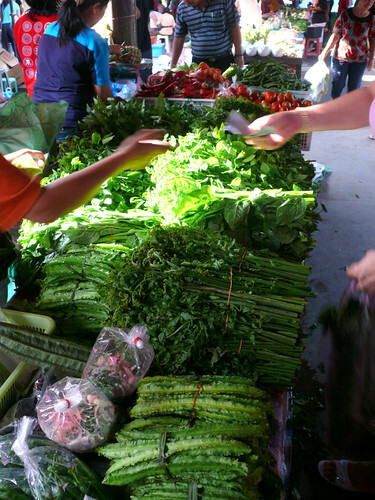 We have bak choy, choy sum, rocket (too much of it), sweet basil, glutinous corn all the year through, almost. There's also Lebanese cucumbers (love them), white-stemmed kangkong, sayur manis, sweet potato leaves, Thai basil, mint, chives, parsley, daun kesom, lemon grass, pandan, spring onions and even taro and a small rosemary plant that Ming brought in from Australia. That tall veg is an heirloom veg (to me) called mak choy that people used to feed ducks with, I'm told, but I love it in soups. It's a cleverly-designed veg that takes very little space because it grows upwards--you just pick the leaves around the stem and it continues to grow up. We also have dwarf papaya trees but unfortunately with so much rain recently, they are looking rather sad. --lightly rub a pinch of salt all over. 1. Put the first 5 topping items into a bowl and mix in the seasoning. Leave for 10 to 15 minutes. 2. Get ready a steaming wok. 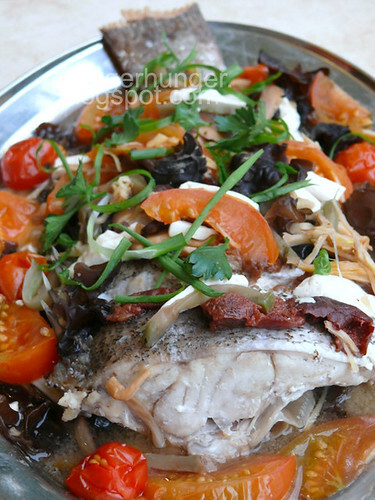 Put the fish on a heat-proof plate and push some of the seasoned toppings under and on top of the fish. 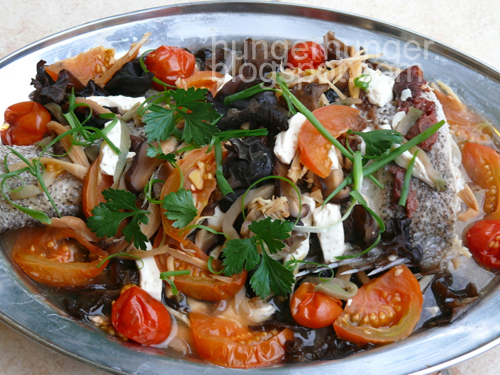 Scatter the remaining toppings over the fish. 3. Steam the fish at high heat until it is just cooked, usually 10-12 minutes. Garnish & serve hot. You can drizzle 3 T heated oil over the fish for extra flavor.